So this last weekend, we noticed that M’s appetite had fallen off pretty dramatically. It’s not unusual for kids to go through periods of more or less appetite. She otherwise was well, no fever or other symptoms and played at the park and slept her usual. With the Division of Responsibility in feeding, I trusted her when she said she wasn’t hungry, when she stopped eating after one or two bites. I would not think of pushing her to eat more as I have seen her eat more and less at times. Trusting her internal cues of hungry and full meant a pretty easy weekend of small meals and snacks. I can’t imagine if I had tried to push her to eat more when perhaps she was starting to fight off a stomach bug. Glad I don’t have to second guess that part of parenting! I let her do her job of deciding how much to eat. 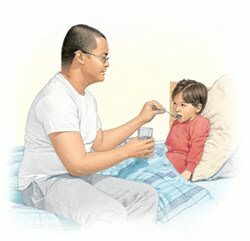 How do you feed your children after they’ve been sick? I tend to relax the rules greatly and let her nibble and sip throughout the day on foods that she has an appetite for. I might regret letting her choose popcorn (I’ve never thrown up after eating popcorn-have you?) As a kid I loved jello with bananas, but M doesn’t go for it! It's pretty hard for a kid to get dehydrated unless they're really vomiting or having diarrhea or otherwise out of it if he has access to liquids. He would probably love some watered-down juice. 100% fruit juice is a nice option. It's what we drink after water and milk. M loves it, and we keep it under 4 ounces a day with no problem. She loves water too though. Consider a fancy thermos or other container with a fun straw too. Popsicles were also a hit with an upset tummy… Good luck and feel better everyone! We too were watching the Broadway version of Peter Pan on Netflix this afternoon! Crazy! My toddler has been sick with a runny nose and I've been fretting about his lack of appetite a. I'm mostly worried about his liquids. He takes only sips of milk and I try not to have juice in the house. I'm thinking while sick I may need to resort to juice (diluted with water) or made into popsicles. I think I'll try jello, that's a good idea. I haven't ever made it as an adult so it will be a fun experience, I'm sure.